Gifts always look unique when you add some type of embellishment. Paper flowers are available for purchase at the craft store and always add a special touch to presents. Although you may purchase them, these paper flowers are super easy to make at home. Not only will you save money when making them yourself, but you will have the added benefit of choosing unlimited colors or paper types. Premade flower embellishments only come in a few colors. When you make them yourself, you have the option of making them your way! These flowers are 3.75 inches in size, but you can adjust them in your digital die cut software to your liking. The possibilities are endless! 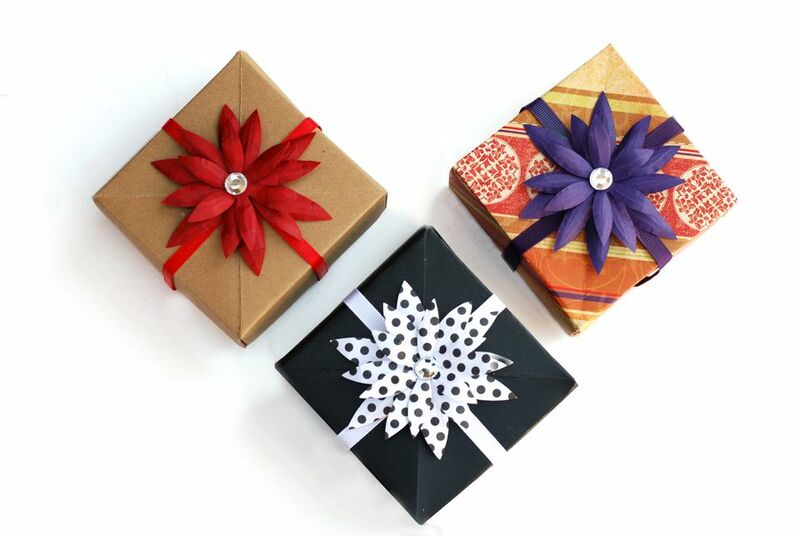 These paper flowers coordinate very well with the paper origami box project you can find here. Download digital die files or pdf printable template here. Cut out the three flower parts on your digital die cut machine. If you are cutting the flower parts by hand, print the pdf template on an 8.5 x 11 sheet of scrapbook paper, and then carefully cut out the flower parts with a craft knife. Place the flower parts face down onto an old mouse pad or sheet of craft foam. Score vertical lines onto the back of each flower petal with a bone folder. Roll each petal around a pen or pencil vertically and horizontally. This will give you petals depth and dimension. Place a foam dot onto the center of the largest petal template. I didn't have any foam dots on hand when I made the flower so I used regular double sided foam tape and it worked just as well. Just cut a tiny piece of the tape, remove the paper and place onto the center of the largest flower template. This will be the bottom portion of the flower embellishment. The foam dots or tape add added depth and dimension to the paper flower, giving it a three dimensional appearance. Place the second largest flower petal circle onto the bottom petals making sure that the top petals are placed between the bottom petals as in the photo above. Press center of top petal template down firmly. Place a foam dot or piece of cut foam tape onto the center of the top petal template. Place the smallest flower petal circle onto the other two flower petal templates and press the center firmly to make sure the petals adhere to one another. Apply the jewel to the center of the paper flower. Curl the petals with your fingers to add depth to the flower. Apply a foam dot or foam tape to the bottom of the flower and attach to gift package.